It might be the smallest country in South America, but Ecuador packs a mighty wallop when it comes down to having more than its fair share of varied landscape, wildlife, bird species, culture, and climate. It can rightfully boast that it has just about everything that the modern-day tourist is looking for. Fantastic scenery which includes mountains, volcanoes, and beautiful beaches, a vibrant indigenous culture, well-preserved colonial towns, and a moderate climate all contribute to its growing popularity. At one time the main objective of the tourist coming to this little country (about the size of Nevada) was to see the creatures that live on the Galapagos Islands combined with an obligatory stay in the capital city of Quito which they invariably flew into before heading for those islands of Darwinian fame. Very few ever bothered to go further afield. That is all changing. 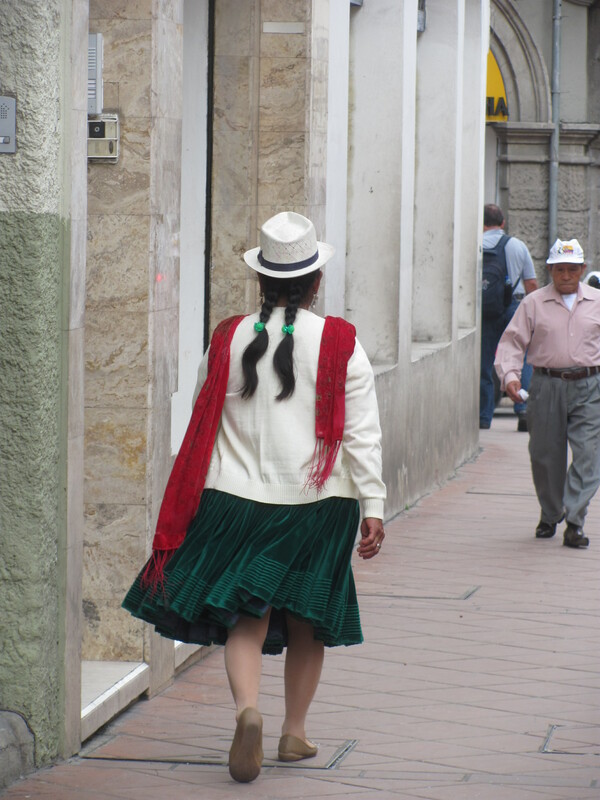 Today’s tourists are venturing out and beyond to see all that Ecuador has to offer. In fact, some are giving the Galapagos a pass because it’s become just too expensive for many pocket books. That is certainly true for me. Those of us on small budgets are looking instead at visiting the Isle of Plata in the southern part of the country where one can see those blue-footed and red-footed boobie birds. It’s called the ‘poor man’s Galapagos’. 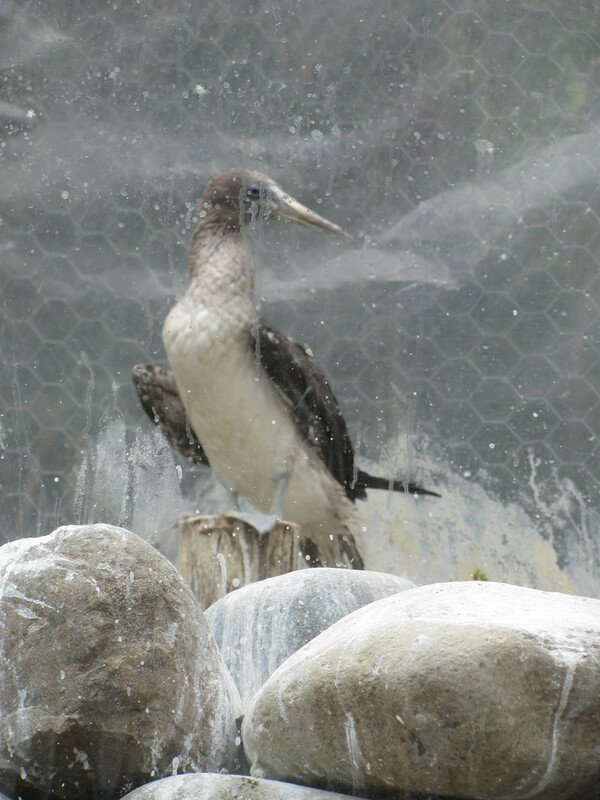 A blue-footed boobie at the Cuenca zoo. For years I have been reading and hearing about the virtues of this country and why it’s becoming a haven for North Americans seeking to escape the ‘rat race’ and find a simpler lifestyle. Since it has been relatively inexpensive to live here and has such a temperate climate, among many other benefits, it’s fast becoming the ex-pats number one choice for retirement. I wanted to check it out for myself to see what all the brouhaha is about so here I am to verify if whatever pre-conceived notions I’ve had were true or not. I’ve been here for almost a month and have covered what I think is a fair amount of territory although the younger backpackers wouldn’t agree. 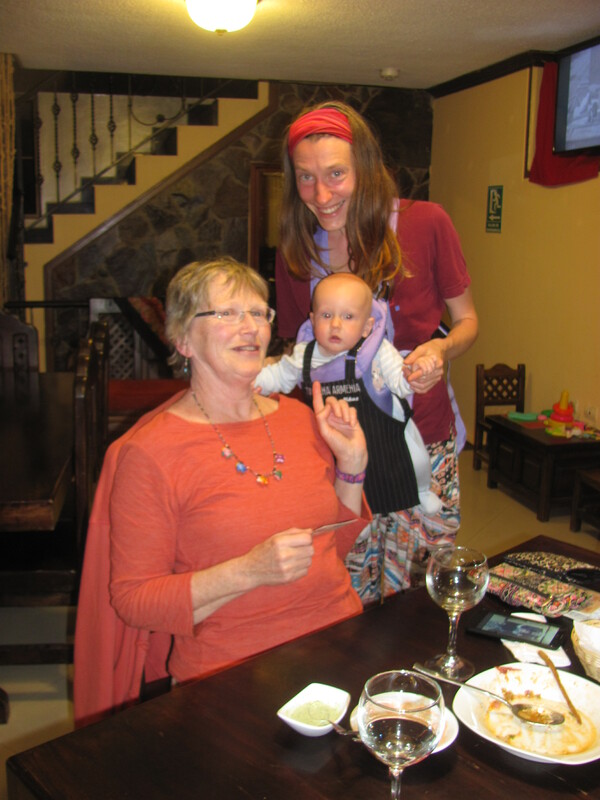 I flew from Buenos Aires to Quito where I met up with my travelling companion from Nova Scotia, Cathy Etter. We go back a long way when we first took off for Europe and Israel with our backpacks in 1969. Today we travel with our suitcases! 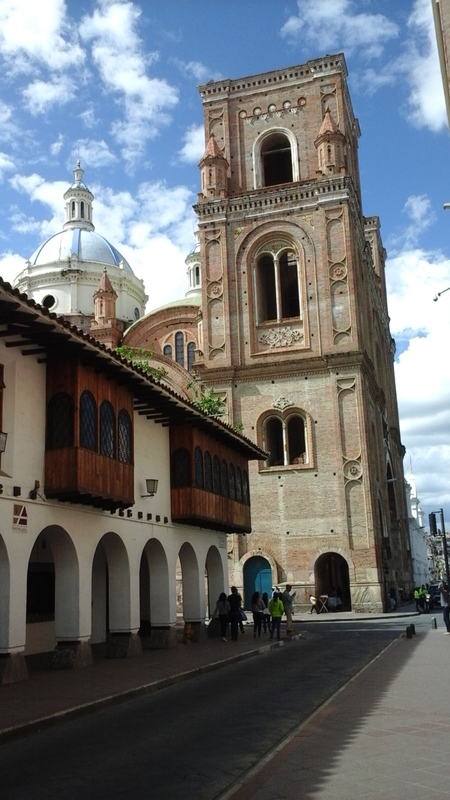 Our first couple of days in the thriving city of Quito were spent adjusting to the high altitude, the new culture and language, and getting access to money. Let’s say we faced a steep learning curve during those days. 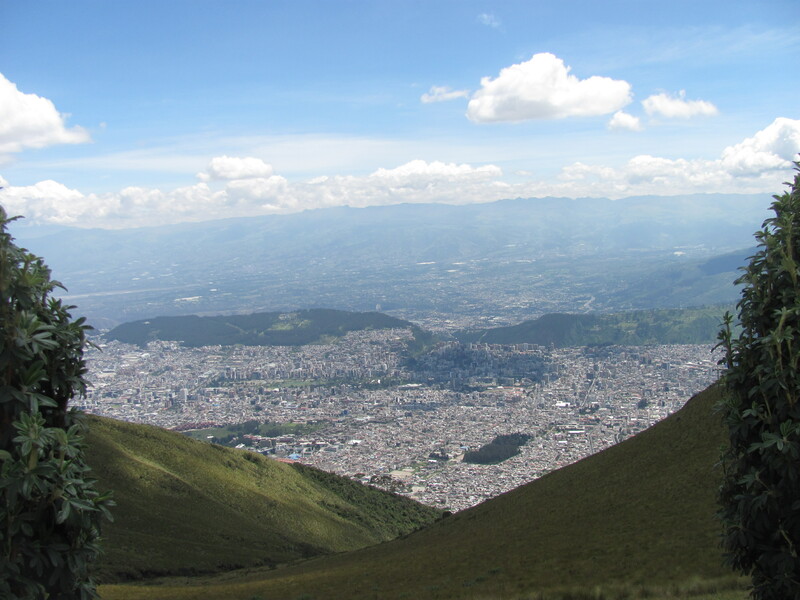 At over 9,000 feet above see level, Quito is the second highest city in the world. The best way to cope with this is to drink lots of water and to move around slowly. This is not an easy thing to do when there is so much to see in a limited time frame. Cathy was visiting Ecuador for three weeks only and, of course, wanted to see as much as she could, and I certainly wanted to help her do that. We did manage to master some basic Spanish words and with the help of Lonely Planet’s phrase book we somehow muddled through our conversations with the people we came in contact with. 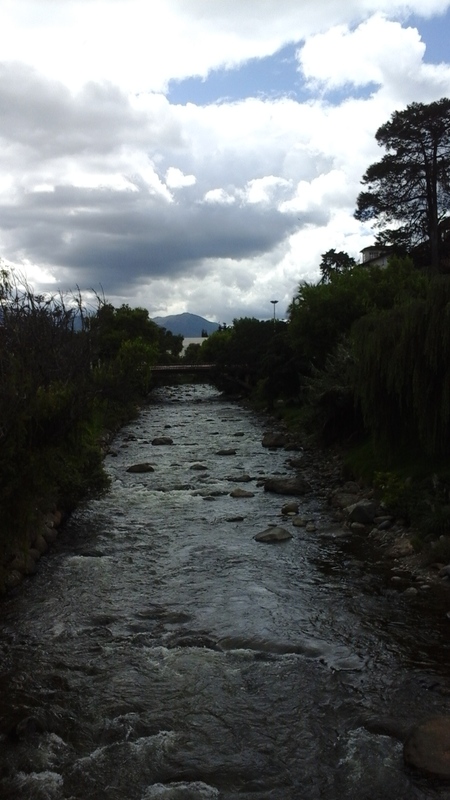 In a big city like Quito this was not such a problem as it proved to be when we got to some smaller places. The money woes for me continued as none of the banks would accept my debit or bank card so I had to resort to using my Visa credit card where I have to pay a higher service fee. I am still waiting to see if my bank can trace what happened to the $400 that I never received the first time I tried to use my card. That on top of the sinking Canadian dollar is causing havoc with my bank account. We have since learned from travellers that it’s best to bring all your American dollars with you and forget trying to get it through the ATM’s. Yikes! Personally I don’t relish carrying around large sums of money but those I know who have done it haven’t encountered any problems mainly because of their diligence and common sense. Cathy did have an American Visa card but that, too, was not accepted for a million incomprehensible reasons. In spite of these challenges, we managed to visit some of the city’s offerings. 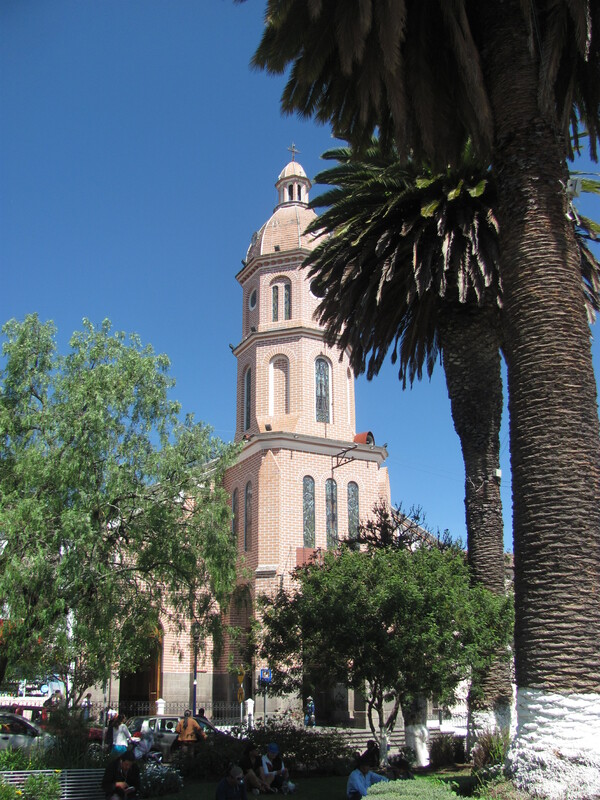 Our first venture was to the Old Town which we could walk to from the La Rosario hotel where we stayed. 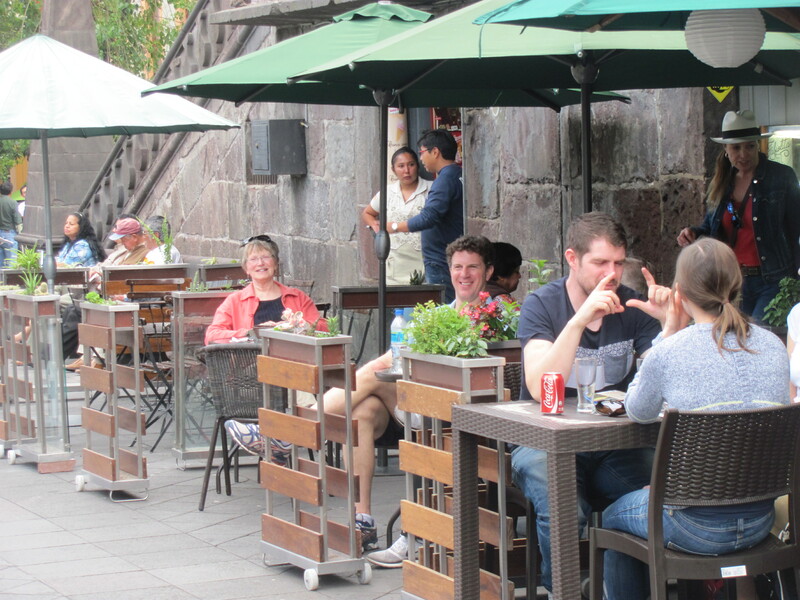 Quito has many beautiful plazas but the most popular is the Plaza de Grande where you have lovely colonial buildings, cafes, and activities going on all the time. This is the hub of the Old Town where we could have spent the whole day. 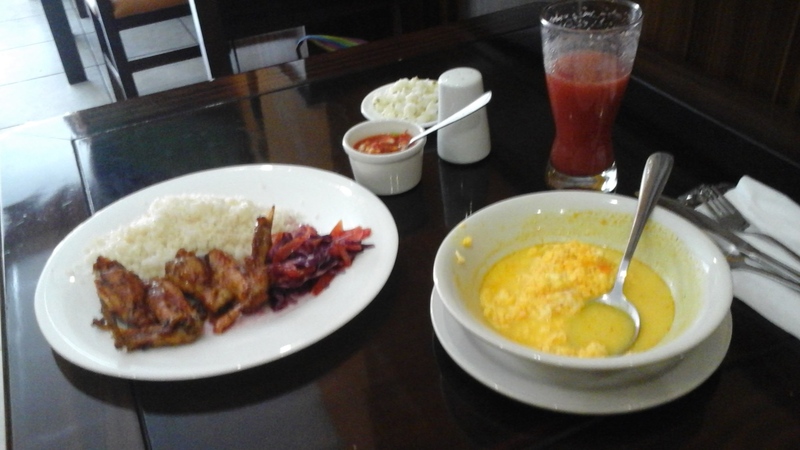 We found a wonderful little cafe called La Fabiolita where we tucked into their daily Ecuadorian special of lamb, avocado, and rice for about $5.oo. 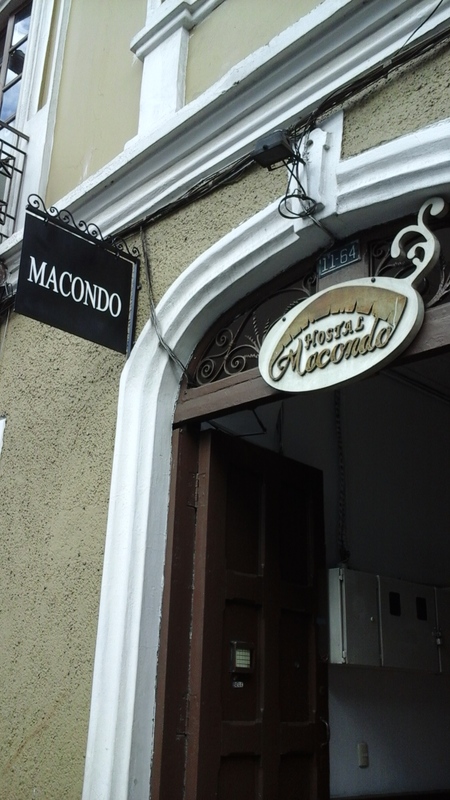 They also served great coffee and their fresh juices like najarillo, mora (blackberry), watermelon, passion fruit, and others I have never heard of, were a wonderful source of nutrients not to mention refresher after all our walking. 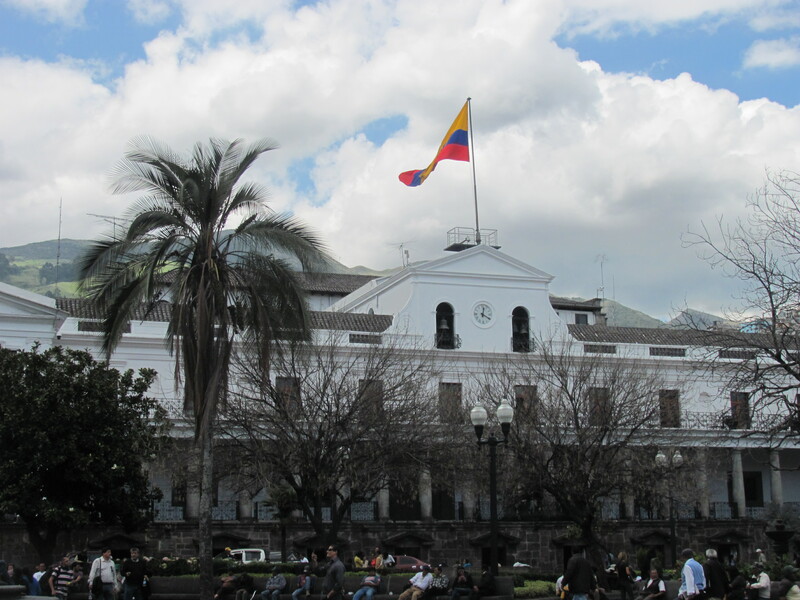 The Presidential offices at the Plaza de Grande in Quito. 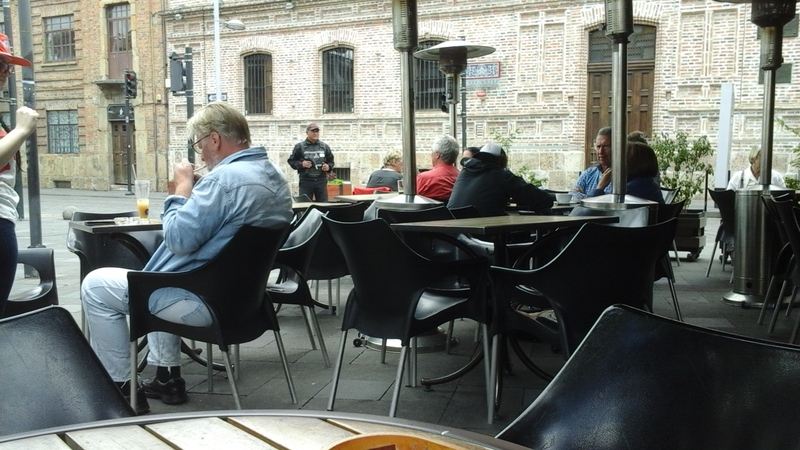 Lunch at the Fabiolita Cafe in Quito. Our second sight-seeing venture had us braving the public transit system. This turned out to be a real bargain (much like Buenos Aires) where $.25 would take you to anywhere in the city. The only problem was that most of the time, the buses were so crammed with people that we couldn’t get on them. However, on the Saturday when we visited the Botanical Gardens in the New Town, we were able to hop aboard, and, no, we did not get robbed as we were warned could happen. Common sense prevailed as we took only the money we needed and kept it very close to our bodies in strong bags with several pouches strapped over the left shoulder so the bags were always in front of us not hanging off the right shoulder or in the back. The rule is to never wear a back pack and if you do, don’t put your money in it. 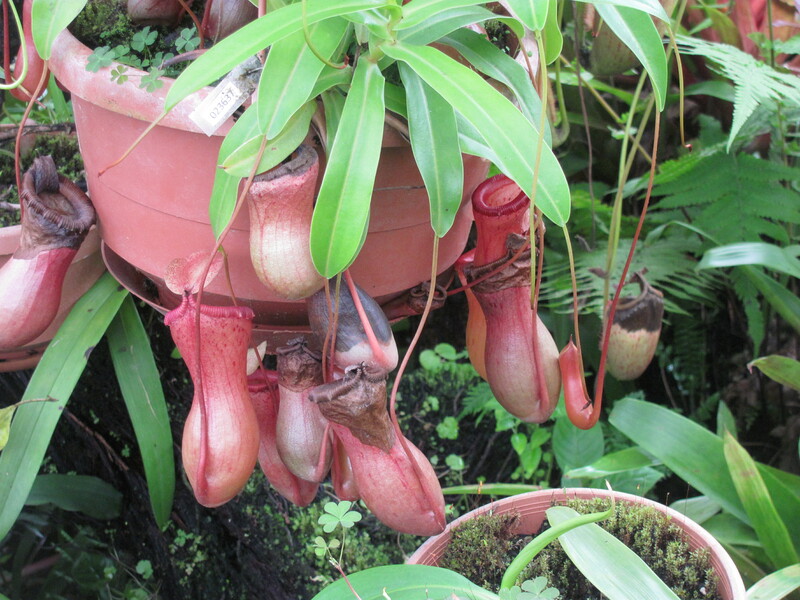 A carnivorous plant at the Botanical Gardens. 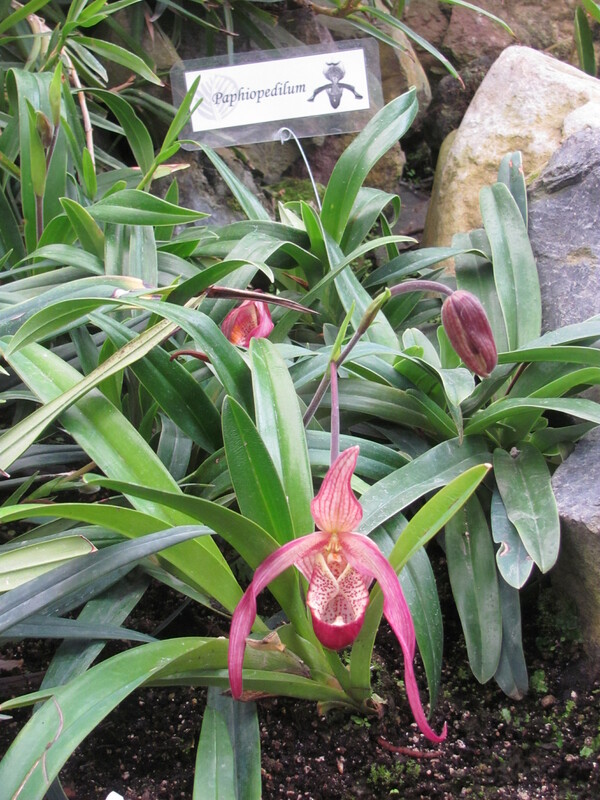 One of hundreds of species of orchids grown in Ecuador. 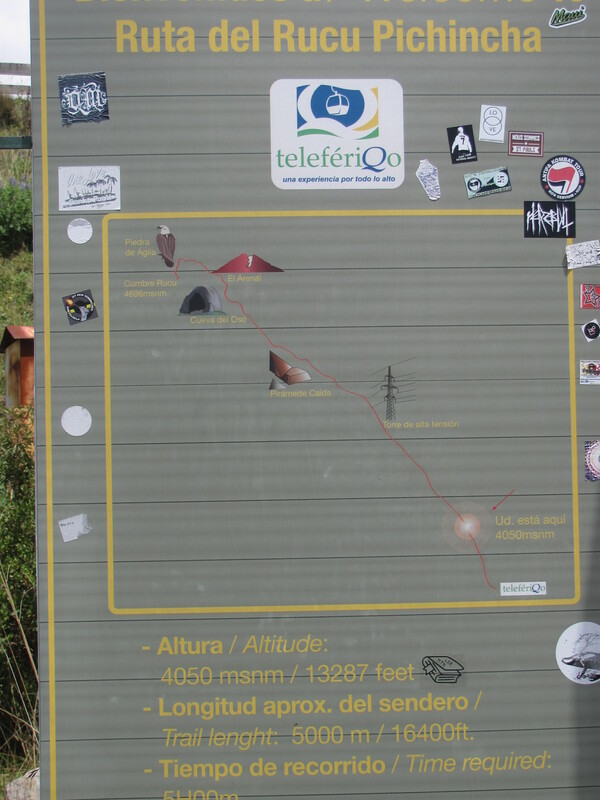 On Sunday we took a taxi to the TeleferiGo cable car which took us high up on the Volcan Pichinchi (over 13,000 feet) which dominates the city. This is one of Ecuador’s more active volcanoes which tends to erupt every so often to let everyone know it isn’t dead. The last eruption was in 1999 when all of Quito was covered in ash. 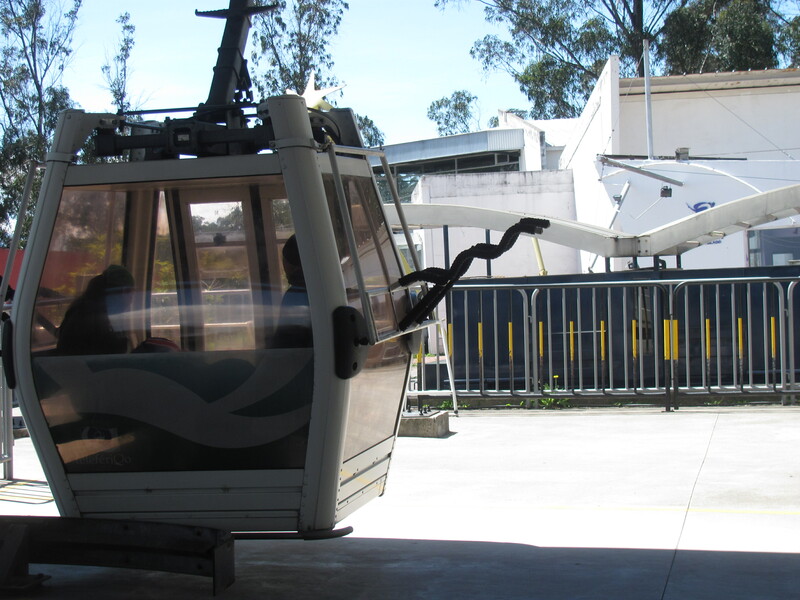 One of the TeleferiGo cable cars to the top of Volcan Pichinchi. 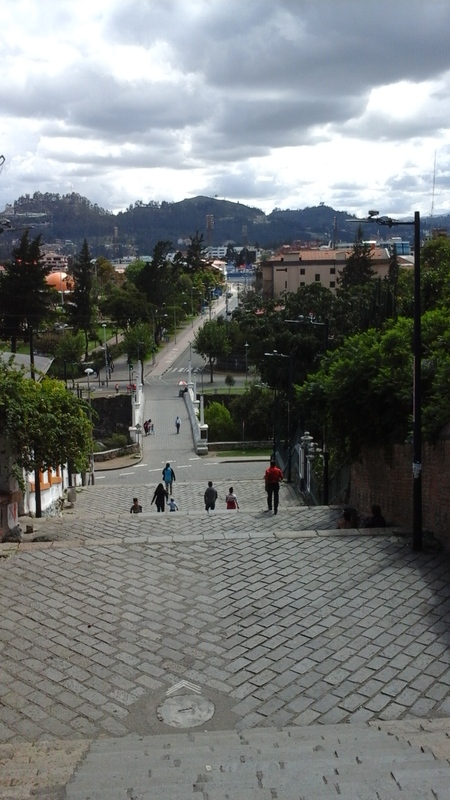 Looking over Quito from the top. We were going up to about 13,000 ft. above sea level. Meeting some llamas on the way. Another incredible view from almost the top. After several days leaving behind much more we could have seen and done, we took the bus up to the town of Otavalo, famous for its gigantic Saturday market – the largest in South America. 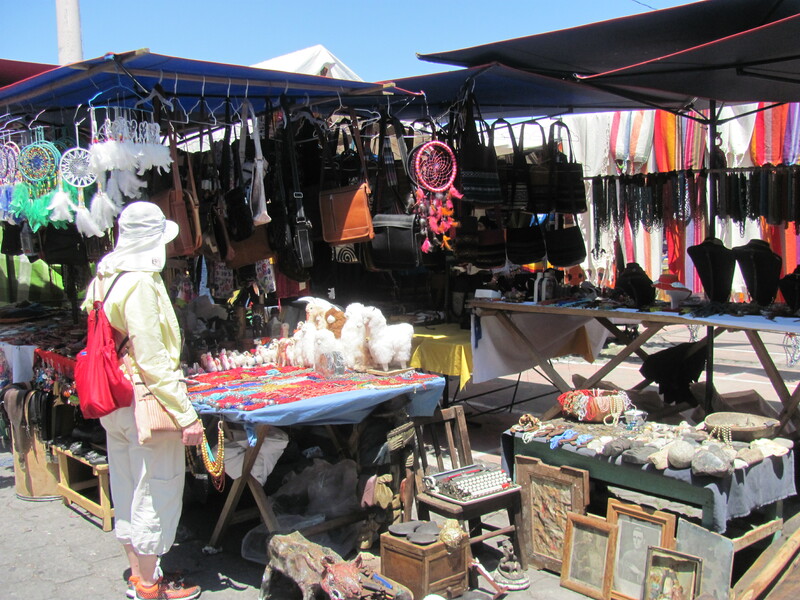 Hundreds of vendors mostly from various indigenous tribes descend upon the town hawking clothing and textiles made from llama and alpaca wool, leather goods, handmade jewellery, and numerous other items which make great souvenirs or resale items. We spent almost a week there shopping and enjoying our rustic cabin which we rented from a lovely lady through AirBnb. Most mornings we were able to sit in her garden with our breakfast and enjoy the many hummingbirds that hovered around us. Although the nights were quite cold, requiring socks in bed, as soon as the sun appeared in the mornings it would warm up very quickly. 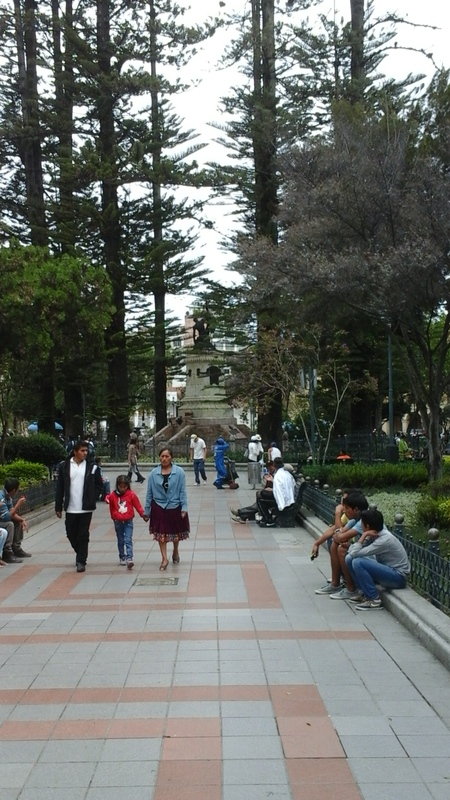 The beautiful main square in Otavalo. 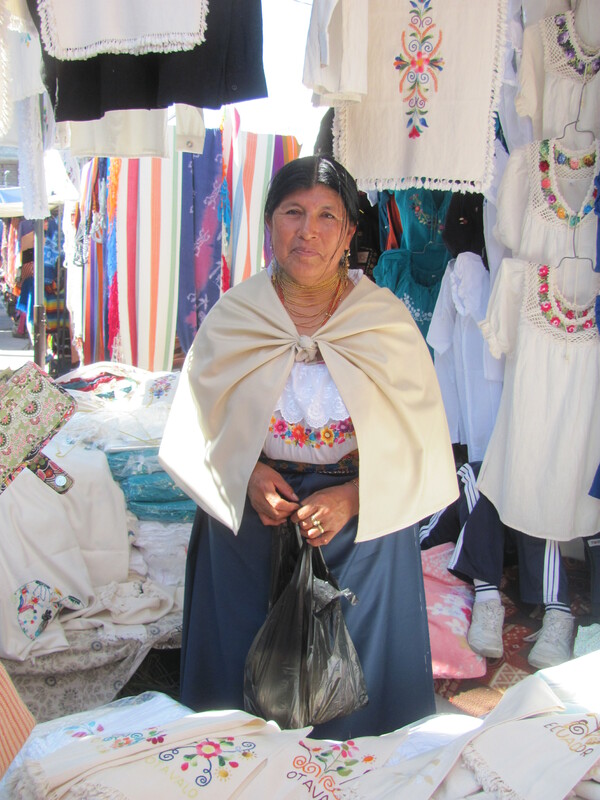 A tiny portion of the market in Otavalo. A vendor selling gorgeous cotton tableware. Having fun shopping for face masks. 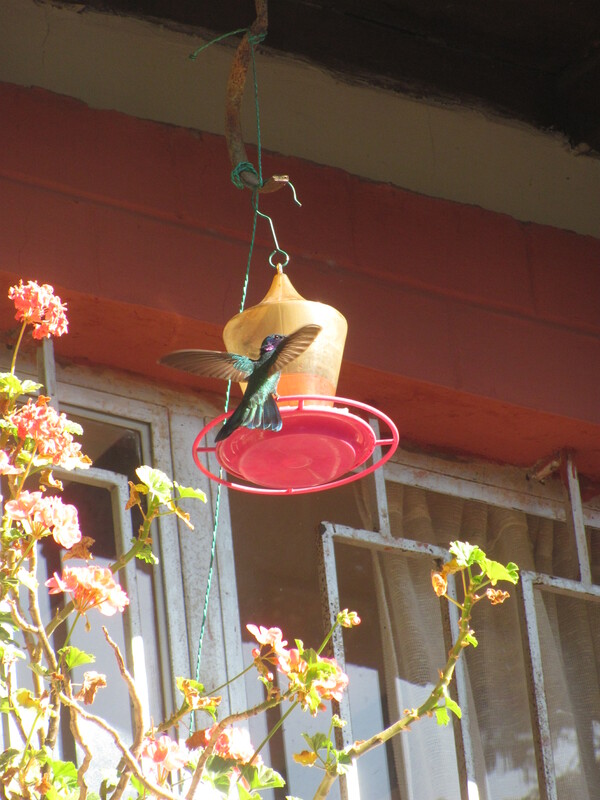 Huge hummingbirds were everywhere in our garden. 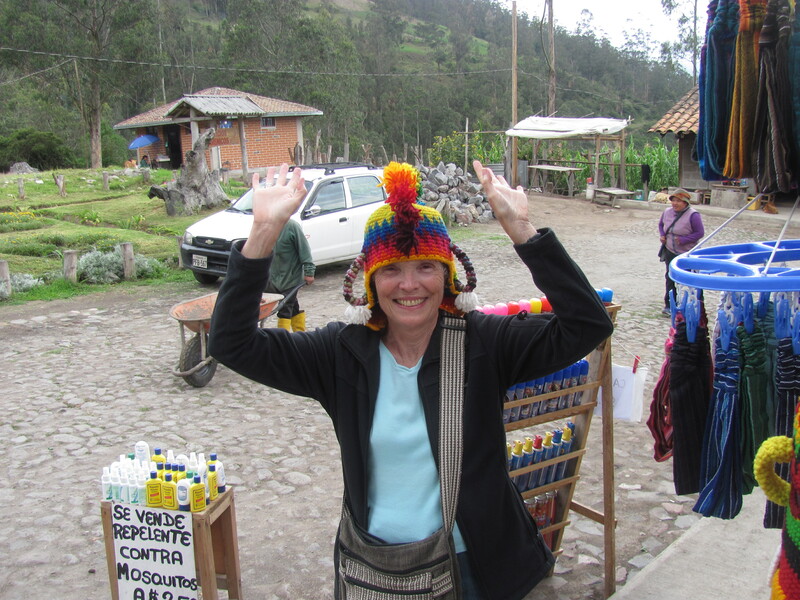 After a week in Otavalo, we had to work out an itinerary for the remainder of Cathy’s time. 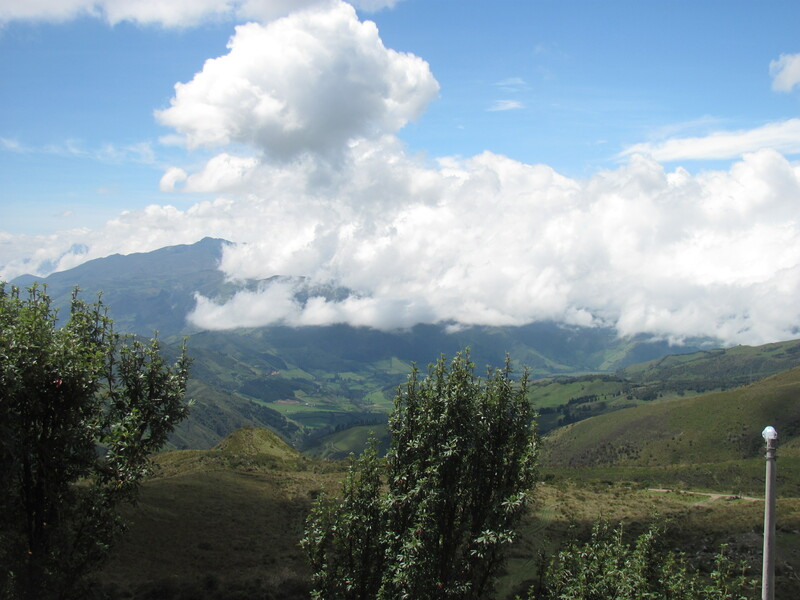 On hearing about the heavy rains on the southern coast in the area of the ‘poor man’s Galapagos’, we decided to forego the boobie birds and head south veering west heading into the interior of the Andes mountain chain where the majority of the towns in Ecuador are located. 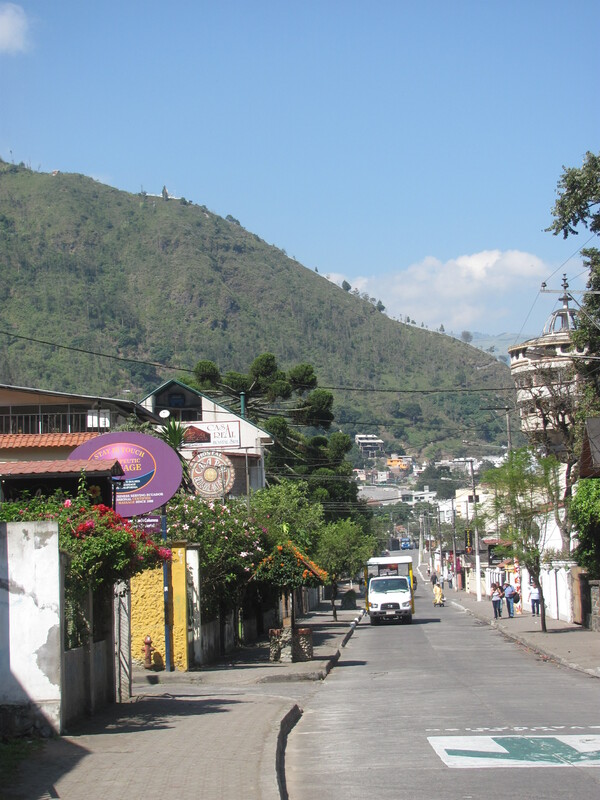 Our first stop was the town of Banos. We arrived late in the day after a very long and tiring bus ride (about ten hours) with many stops including one change of buses. The upside was the fantastic scenery which changed constantly from browns and mostly greens as we wended our way through the volcanic mountains clearly visible on both sides of our bus. I should add that the bus is the best way to go in Ecuador if you don’t want to fly. Trains are almost extinct. Numerous companies have almost the entire country covered and with the government’s drive to build new highways linking all major villages, towns, and cities it’s by far the best way to go. However, it’s best to choose the express buses as we found out if you ever want to get to your destination on time. 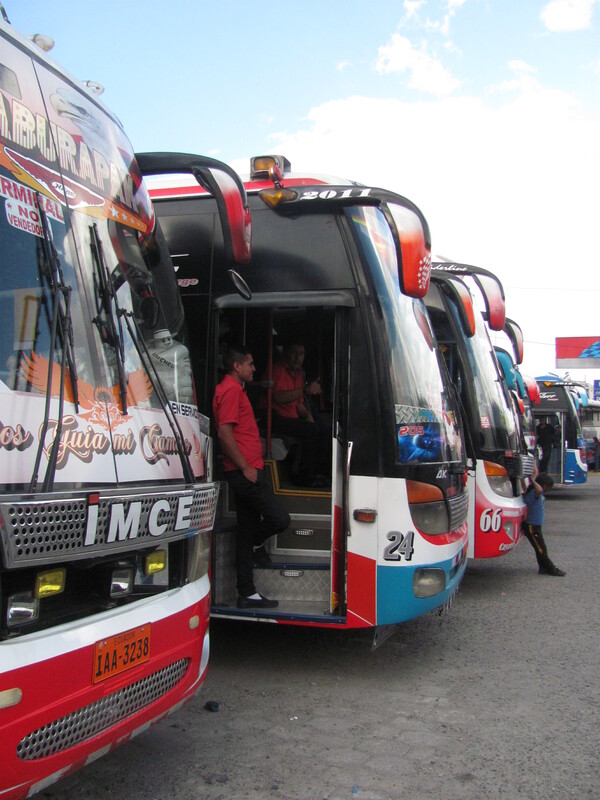 Buses at the ready at Otavalo’s bus station. Banos was a good choice for us. 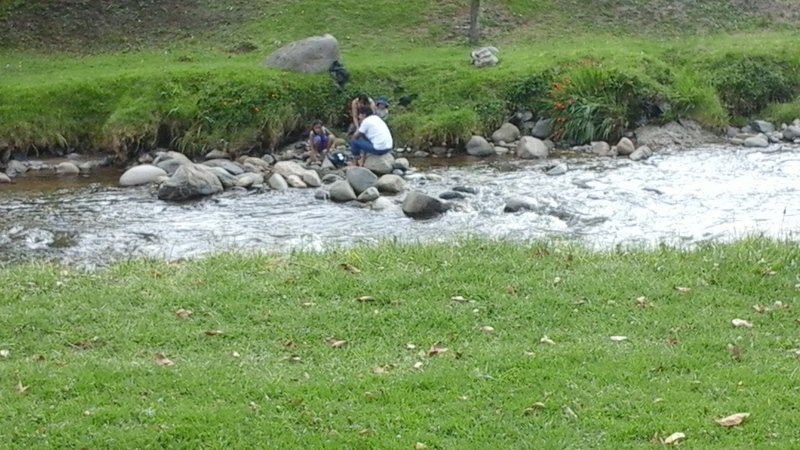 Here we were able to indulge in one of the many thermal baths fed by the Volcan Tungurahua which means “throat of fire”. We chose the Picinas El Salado reputed to be the best. It was clean and well run with five pools from the very hot, to varying grades of warm, ending with the cold plunge. However, these thermal baths come with the constant threat of a volcanic eruption from Tungurahua an active volcano which towers over the town. It last erupted in 1999. At that time everyone was evacuated and had to leave their homes for over a year until they got so fed up they staged a revolt and returned against the wishes of the authorities. There hasn’t been a major eruption since, but there are constant rumblings and fireworks still at play. Accompanying such high mountains and volcanoes comes too many waterfalls to count. We had one cascading down beside the place where we stayed. This was Casa Real which I would highly recommend for its fabulous breakfasts included in the price. You can find them on booking.com. 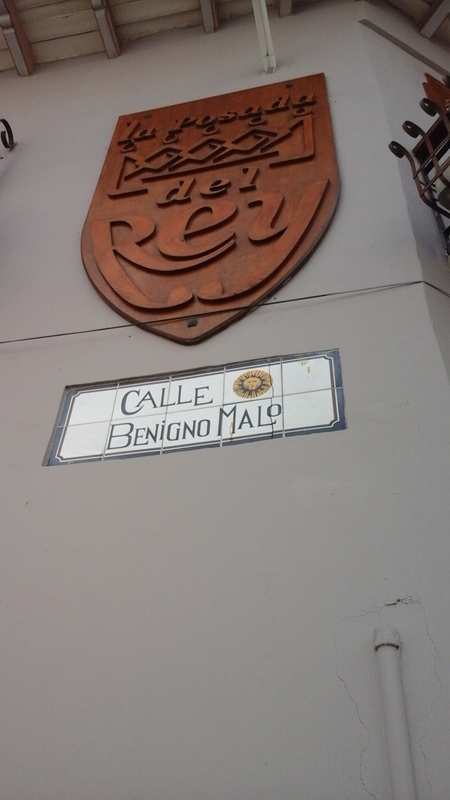 The street where Casa Real is located in Banos. 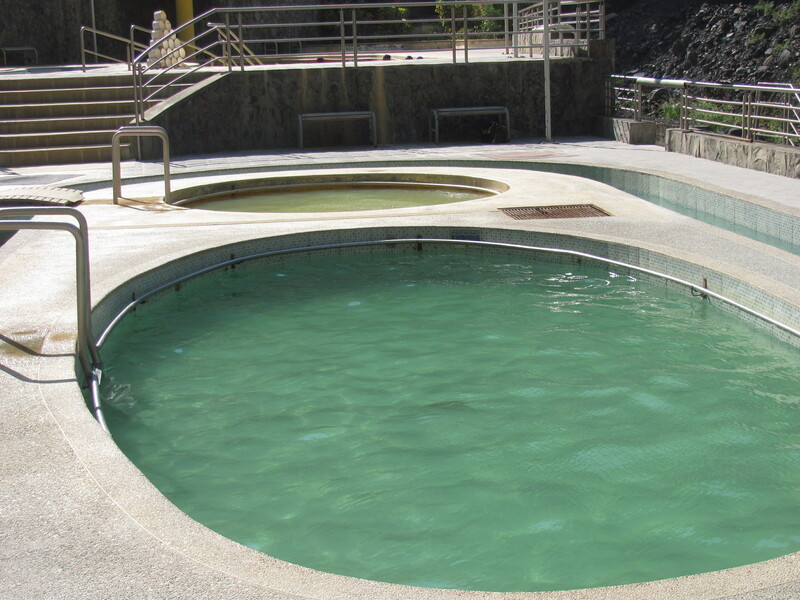 One of the pools at the El Salado thermal bath. 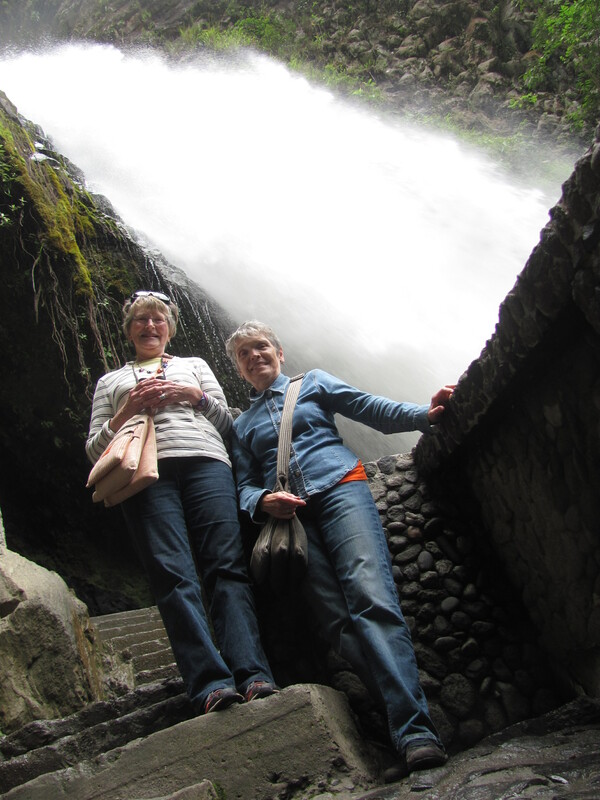 On our second day there, we took a very inexpensive tour called “The Cascades Tour” which took us to some of the many falls in the near vicinity of the town. 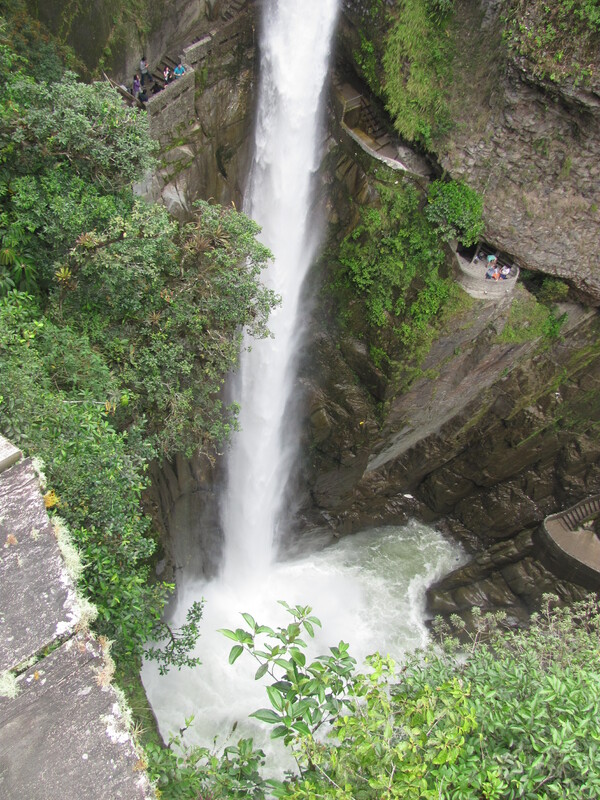 At the San Martin National Park, we had an opportunity to see the falls and gorges via a cable car which turned out to be quite a thrill for us. Our open-topped bus took us on roads that twisted and turned, at least four long tunnels, and other hair-raising gambits which caused lots of shrieks and gasps. If we had more grit and money, we should have taken the opportunity to do some sky diving. The brave young and less fearful ones on our tour did, and every one of them came back safe and sound and totally exhilarated. They all reported that they would do it again. We realized we had missed a golden opportunity. The finale to our tour was a trip down to the truly spectacular Rio Verde falls where we found ourselves practically beneath them followed by the long trek back up to the top. The climb was well worth it especially since our path was lined with gorgeous tropical flora and fauna. Some we were familiar with like hydrangea but others left us guessing. Some of the falls on our Cascades tour. 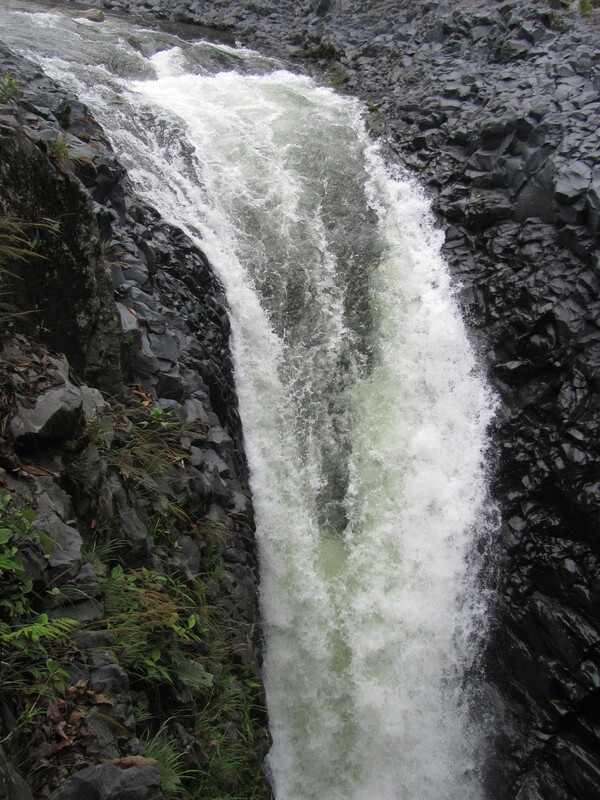 The more dramatic Rio Verde falls. 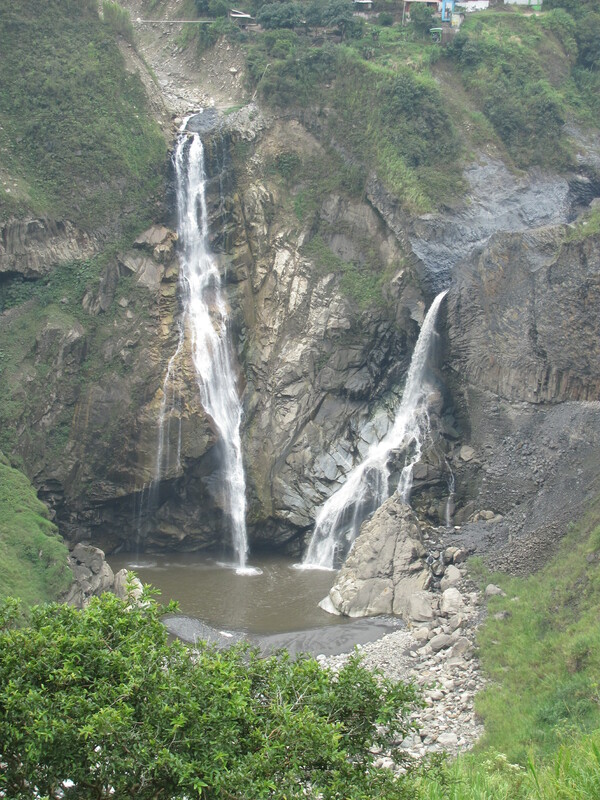 A close up of the falls. Cathy and me under the falls. That night we treated ourselves to a dinner at the Taberna Armenia, a new restaurant which has already achieved the notable distinction of Banos’ top restaurant. 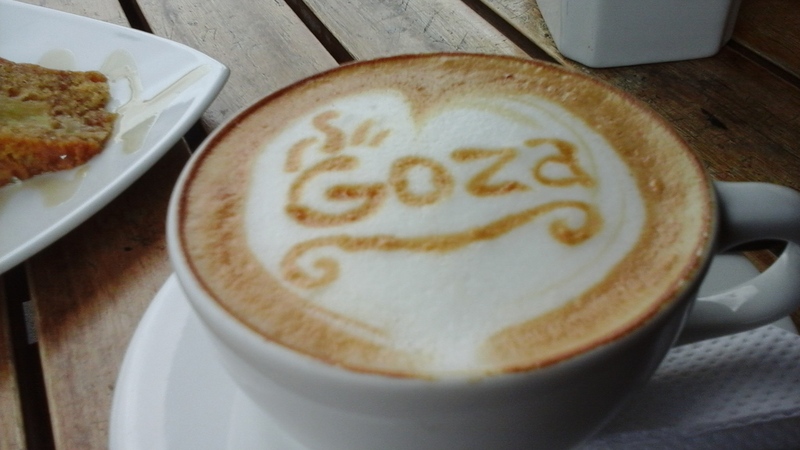 We would not have known about it if our lovely hostess, Miryam, in Otavalo had not recommended it. Started by a young couple from Russia who now have a 5-month old son, it had to be one of the best meals I’ve ever had. The food was expertly prepared, tasty, and beautifully presented. The whole ambience was perfect. The menu reflected a nice balance of the new fresh flavours of today’s Ecuador with the old tried and true recipes from Armenia. For instance, I had a type of perogie, called pellimeni, stuffed with llama meat. The sauces that came with that were divine. As an extra bonus the young chef, owner, husband, and father presented us with a fruit liquor ‘on the house’ to wash it all down. You can find this restaurant listed and rated by Trip Advisor as #1. 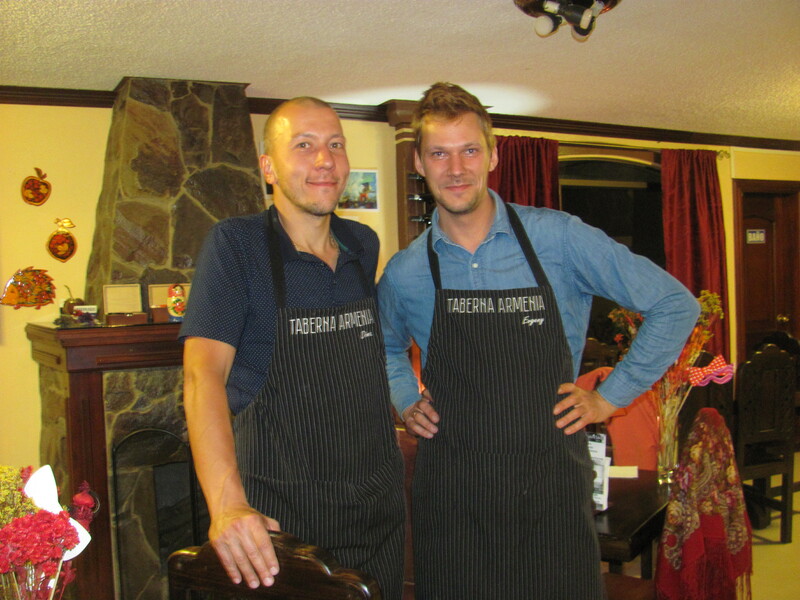 Yvengy (Eugene)and his chef at the Taberna Armenia. Natalia, her son, and Cathy at Taberna Armenia. 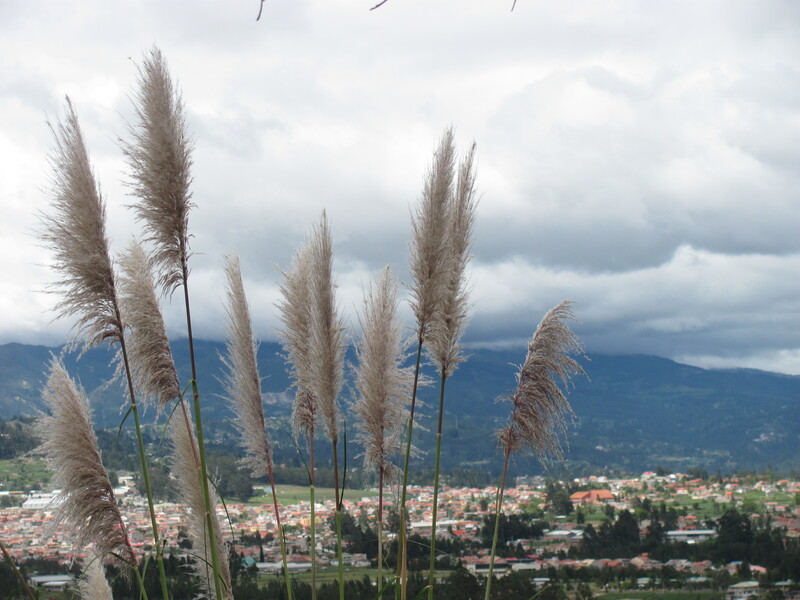 After leaving Banos we were subjected to another long, arduous bus trip further south to the colonial city of Cuenca, one of Ecuador’s fastest growing ex-pat spots. This Heritage Site is not only attracting North Americans looking for a more affordable lifestyle, but also many tourists. 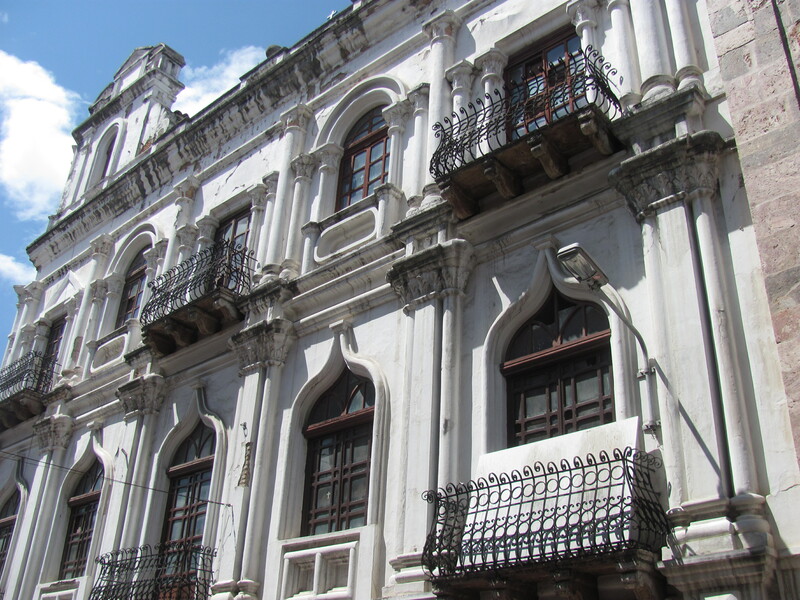 Although Ecuador’s third largest city, it is still not so large that you can’t walk around the old part with its cobblestone streets and well-preserved colonial buildings. It’s main focus is the Parque de Calderon right in the centre dominated by two churches: the Catedral Vieja(1567) and the Catedral Immaculate Conception (1885). We attended for free a wonderful concert at the old church. A Spanish piece by Rimsky-Korsakov succeeded in feeding our souls with some much-needed music. We had the ex-pats to thank for that evening. 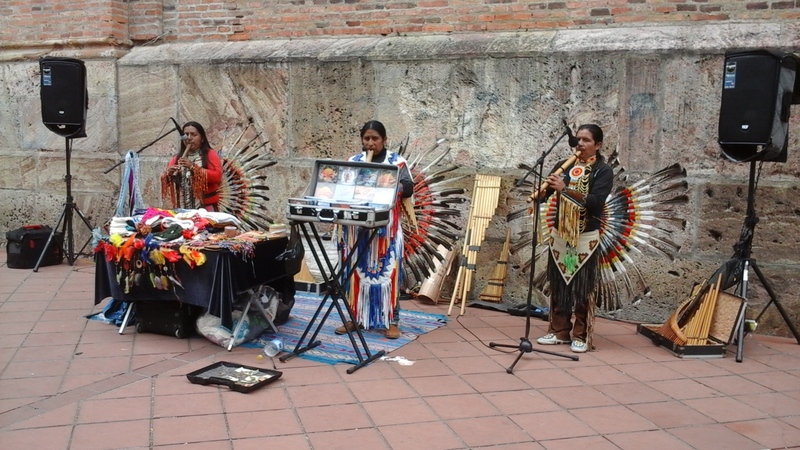 We had hoped to find some folklorica or native Ecuadorian music but had no success. 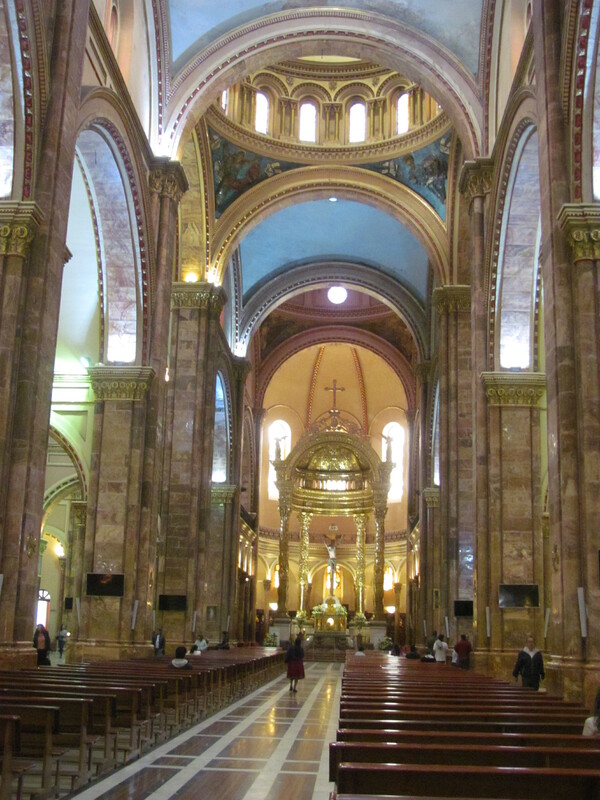 The interior of the Immaculate Conception church in Cuenca. 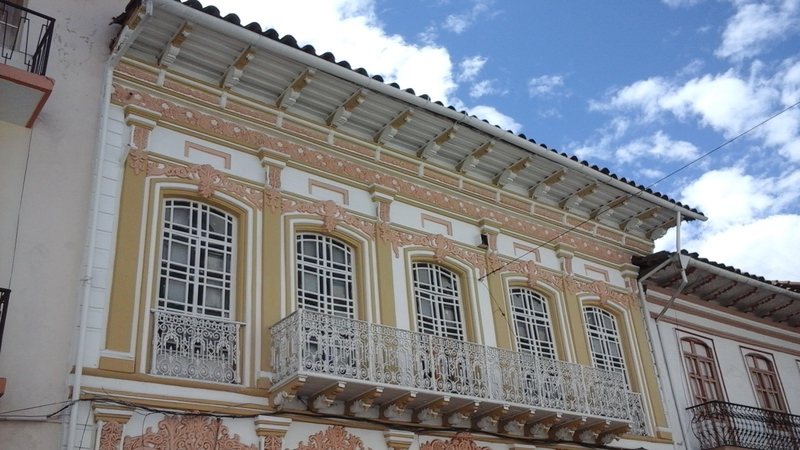 Some old colonial architecture in Cuenca. 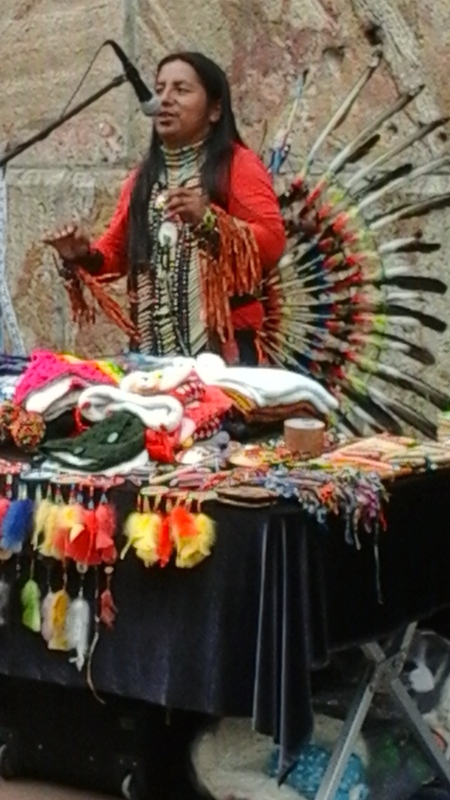 An indigenous woman in Cuenca. 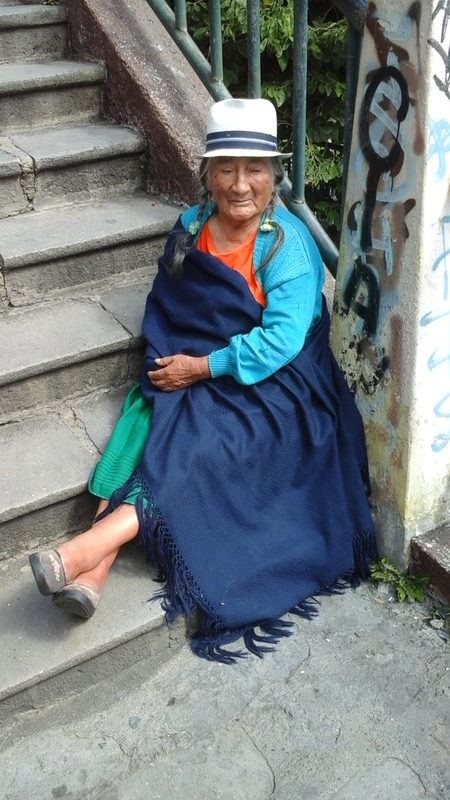 She has two braids whereas in Otavalo the women only wore one. A local family celebrating Carnival week on our bus tour. Squirting foam and throwing water is their idea of fun! After acquainting ourselves with the southern part of the city via an open-topped bus tour and simply walking about on our own, we decided to take the bus to Ingapirca, the site of ancient Inca ruins which we were told were about an hour and a half bus ride away. 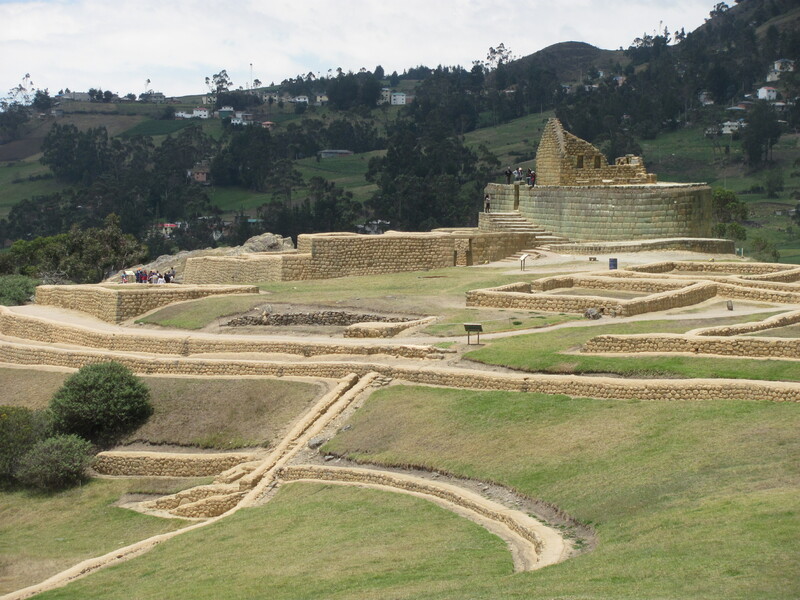 Ingapirca was originally the seat of the Canari civilization, a matriarchal society, which was gradually and insidiously taken over by the Incas, a very aggressive people, in the 1400’s. This would have been the same time the Incan civilization was inhabiting Manchu Pichu in Peru. The final ruination of Ingapirca occurred when the Spanish wiped it out in the 1500’s. 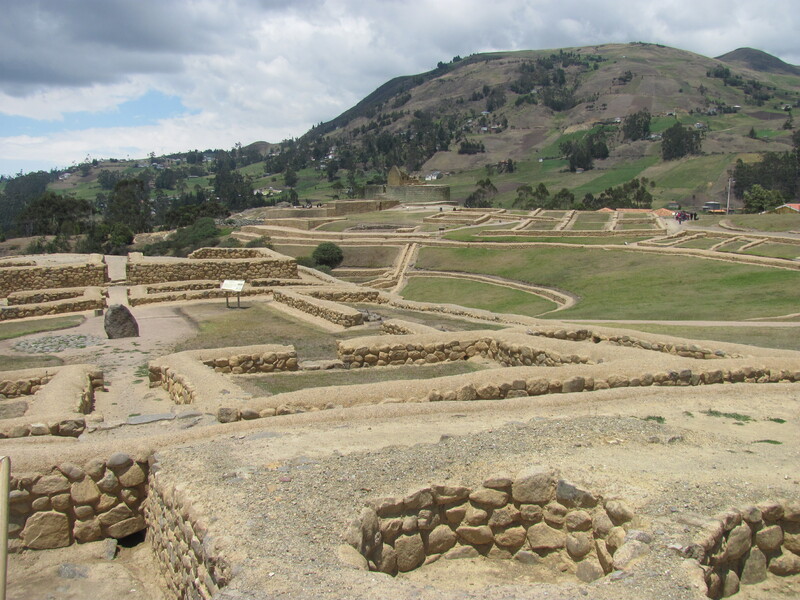 Nevertheless, the foundations and partial walls of the homes and other buildings are a good representation of the kind of stonework that the Incans used with absolutely no masonry. The ruins showing some of the storage basins. To get there we grabbed the only bus running on the Sunday at 9 a.m. and didn’t get to our destination until two and a half hours later, not one and a half! Since the last bus back to Cuenca left at 1 p.m., we soon realised we wouldn’t have much time to explore the ruins. Little did we know that the only way to get to the ruins was by a guided tour which wasn’t scheduled to begin until 12:15. Do the math and you will see we had just three-quarters of an hour for our tour. The thing was, neither of us bothered to do the math and neither did some of the others, so you guessed it: we missed that bus by about 15 minutes! Now ordinarily this would not be a big deal anywhere else if we could speak some Spanish and those who spoke it would be more patient with us, but in Ecuador nothing is so simple. 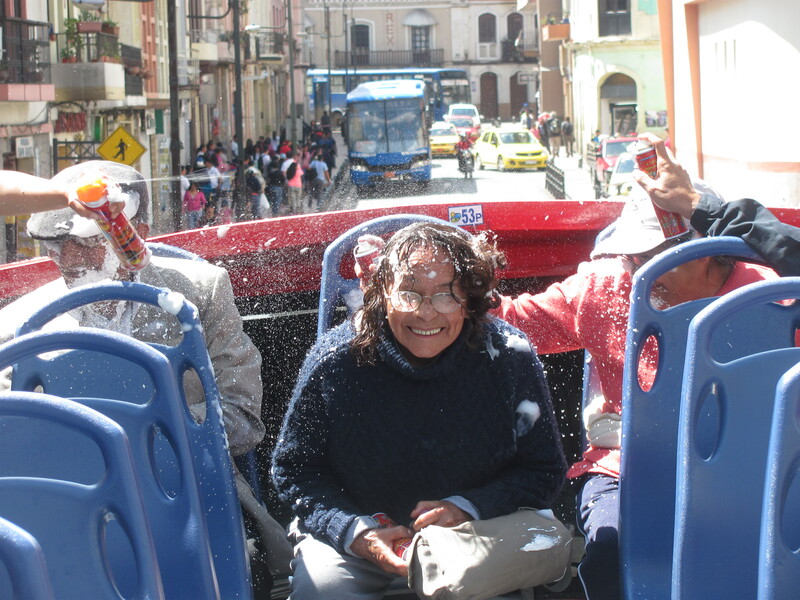 Fortunately, one person from our group who was using the bus was an Ecuadorian who spoke fairly good English so we gave her and her daughter the task of finding out when we could get a bus back to Cuenca. We found out that there would be another at 3 p.m. so there it was: we had another 2 hours to kill! We were not allowed to go back in and finish our tour. Fortunately or unfortunately, depending on how you look at it, there were lots of vendors around just dying for us to spend our money so that’s just what we did. 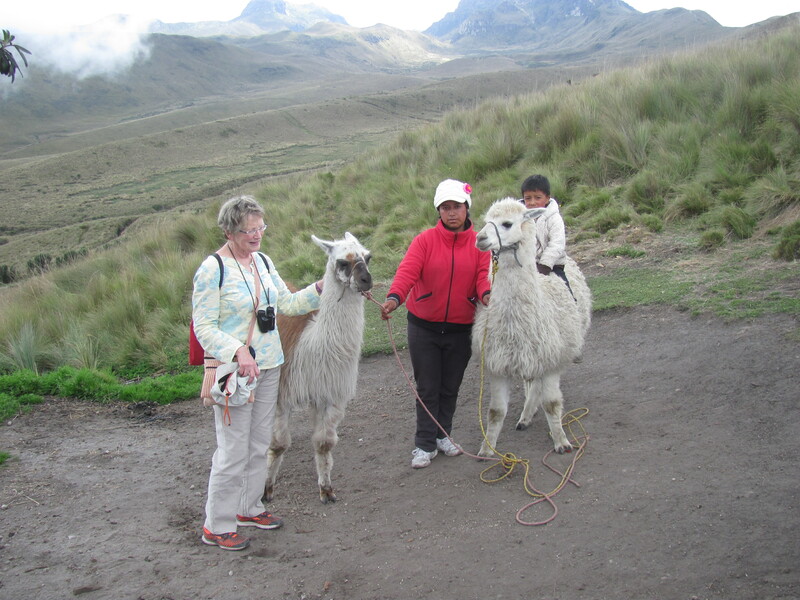 Actually, it turned out quite nicely for me because it had turned cold as often happens in Ecuador, and I was in need of one of those warm, comfy looking llama pullovers I had been seeing since our days in Otavalo. I was glad I finally succumbed. It made the wait go so much easier being wrapped up in the warmth of that new sweater. The only downside was that it made for a long day not putting us back to Cuenca until 7 p.m.
Two days later, Cathy’s three-week holiday came to an end. She flew back to Quito to get her flight back to Canada, and I stayed on for a few more days at a new hostel in the new part of Cuenca to recoup from a cold and get a much-needed rest. 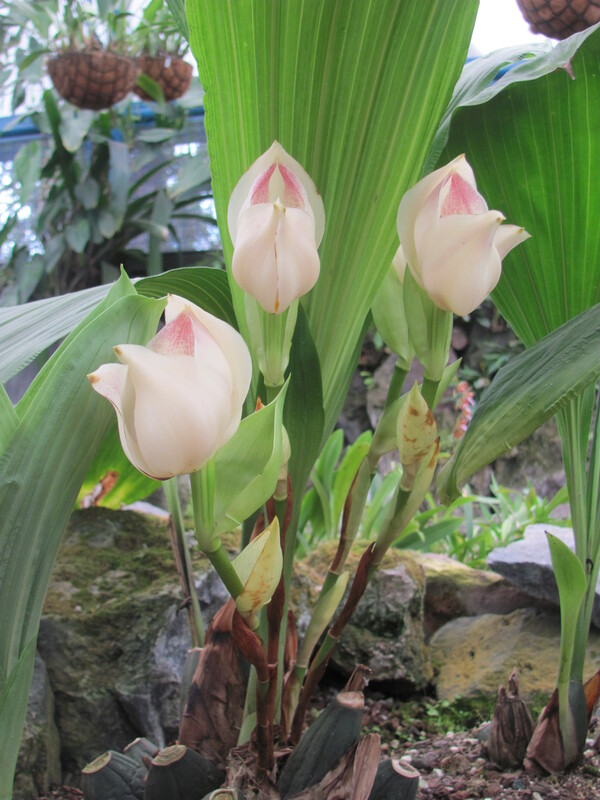 I am much better now that I am in the warm, more tropical climate of Vilcabamba in the south. Now I have no more excuses for not writing more frequent posts for my blog. I will definitely keep you more up to date with the impressions I am forming of this diverse and interesting country. Over looking Cuenca from the zoo.